It's time once again for me, Darlene, to share an inspiration sample. Today I'm doing a Christmas card in hopes of getting ahead of the game on the number of cards I will be needing for my own person use. I had a little fun today with ink and sponges. On my base white card I sponged Tim Holtz 'Faded Jeans' ink around the edges. Next I adhered my Spellbinder '5x7 Reflective Moments' #S6-011 die cut panel. only heavier. Then die cut my Impression Obsession 'Snowflake Background' #DIE211 of white card stock and adhered to the blue panel. This panel has been popped up with dimensional tape. Lastly came a little dimensional decorating. 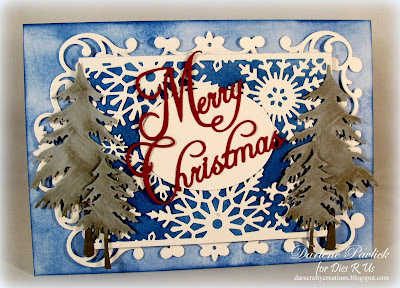 with white craft ink using a sponge. I have used Frantic Stamper 'Merry Christmas' FRA-DIE09619 die cut from red cardstock as my sentiment but I see at the time of this posting it is Out of Stock. 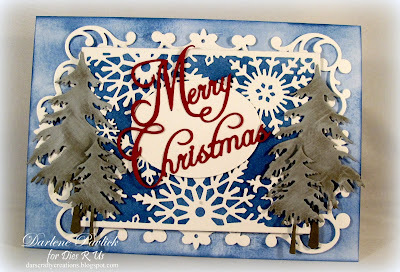 May I recommend Frantic Stamper 'Happy Holidays' FRA9620 as a substitute. Or any of the various company sentiment dies available at the Dies R Us Store. Well, that's about it for me today! Thanks so much for stopping by and don't forget to come check out the new challenge at our Dies R Us Challenge Blog! We'd love to have you join in the fun and who knows, YOU could be our next winner! !